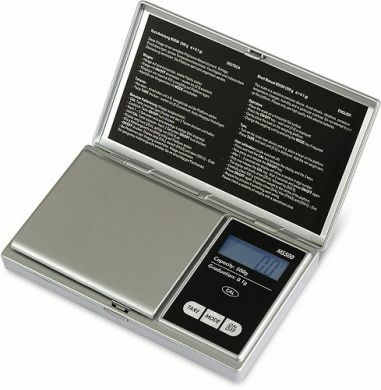 Professional digital pocket scale with extreme resolution of 0.01g over a wide capacity range of 200g. Stainless steel platform is protected by a stable hinged, transparent cover that doubles as a weighing bowl if used upside down. A quick user guide in English is attached to the inside of the cover. The illuminated touch screen with large keys and figures is easy to operate. A counting function for small identical parts is included. Four different weighing units. Professional 2-step user calibration with optional weights (sold separately). Backed with a 2-year warranty from the manufacturer. Capacity: 200g / 128 dwt / 3086 gn / 1000 ct.
Readability: 0.01g / 0.01 dwt / 0.1 gn / 0.1 ct.
Linearity: ±0.02g. Tare Range: up to 100% of capacity (does not reduce weighing range).Units: 200 g Model, g, dwt, gn, ct.
Power: 2 “AAA” batteries. Display: 5 digits, 9.5 mm high, with backlight. Pan Size: 2.68" x 1.78". Dimensions: 4.75" x 2.8" x 0.70".